Volleyball, what a great sport. Volleyball is a hard sport though. There is a lot of running in volleyball. No running in volleyball? When was the last time you ran 10 feet, threw yourself on the ground, and got back into position all in 3 seconds? See, volleyball is just as good a sport as football or baseball. You want to know more? Well I guess your just gonna have to read this awesome article about the amazing sport we call volleyball. LET’S GO!! Rules, they aren’t complicated, but there are a lot to memorize. Some basic rules are, only 3 contacts then you have to send the ball over the net. Another rule is that you cannot be in the net. When serving, you have to stay behind the ‘out-of-bound’ line. If you cross that line while serving, a serving foul is called and the other team gets a point. There are lots and lots of rules, but once you get the hang of it, they will all become habits not rules. There are a lot of different plays as well. For instance, bump, set, spike. That is what is normally expected, but there can also be plays like bump, bump, tip or set set spike or whatever. But your team can only make contact with the ball 3 times until you have to get the ball over the net for the next 3 contacts. You can send it over on 1 contact or 2 but the max is 3 and if there is anymore than that, the other team will get a point. Those are just the basics. There are a whole lot more rules and plays but that will get you started. "In college it would be waking up to run my 6 minute mile. I would then have low fat yogurt and granola. Then I go to class from probably about 8 am to about 2, and then we would go straight to the weight room and do our workout for, I would say, an hour and we would lift weights and condition. After that we would go straight from the weight room to the gym and do our practice for about 2 hours, 2 and a half some days. Then after practice, we would go back to the locker room and we would watch a video on the other teams we were gonna play. And then our team would go eat dinner together. Then I go home and cool down with a 11 to 15 minute mile walk. And finally, the end of our night was just showering and going to bed. Not much of a fun after time after that because you’re just so tired you want to go to bed. Kristin’s workouts consist of lifting weights, burpees (with pushups), squats (those help with leg muscle and shuffling), sit ups (they help with core muscles), lunges (help with leg strength), push ups (help with arm and core strength) and running. Kristin runs an 6 to 7 minute mile in the morning, and walks an 11 to 15 minute mile every night for a cool down for the day. Kristin doesn't have a specific diet but she did need to eat healthy. so she could stay fit and so that her practices wouldn't be very hard. She knew it would benefit to be healthy in the end. One professional volleyball player is Kristin Stauter. In a recent interview with her, she answers some questions about her life as a volleyball player. Question 1.) What position do you play? Question 2.) What do your workouts/ practices consist of? Well 3 days a week we would weight train in the weight room. So that was like lifting weights and doing running as conditioning. And then every single day we practice for about 2 and a half hours. Question 3.) What is a typical day like for you? In college it would be going to class from probably about 8 am to about 2, and then we would go straight to the weight room and do our workout for I would say an hour and we would lift weights and condition. And then we would go straight from the weight room to the gym and do our practice games for about 2 hours, 2 and a half some days. Then after practice, we would go back to the locker room and we would watch a film or video on the other teams we were gonna play. And then our team would go eat dinner together. And then the end of our night was just showering and going to bed. Not much of a fun after time after dinner because it's a your-so-tired-you-just-want-to-go-to-bed type of thing. Question 4.) How do you mentally and physically prepare yourself for a game? Mentally, I would say, um were I mentioned earlier that we would go to the locker room and watch films to study the other teams is what mentally helps you get prepared for a game because you can see what they do and try to learn what they do in a game so you’re. Studying my plays as a setter, we have about 15 plays, um, so I would really study those so I knew them to be able to be the leader on the court. Physically, I would say all of the, um, weights and conditioning and practices are what really get you ready for the game and in shape because if you aren’t not strong and in shape it makes it harder for when you’re in the game. Because you don’t want to get tired mid-game because then you will be worried about that and not the game. Question 5.) 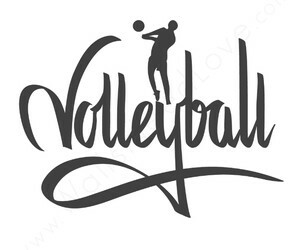 What inspired you to play volleyball? Well when I grew up my older sister played middle school, high school, and college volleyball. My sister played at Illinois State University because she got a scholarship. I loved going to her games because I got to help wipe the sweat off the floors, which sounds gross but it was fun to help the girls on the team because once the game was over they would treat me as if I was on the team. Watching the older girls play was when I realized playing volleyball was I wanted to do. Question 6.) Do or did you have a specific diet? We didn't have a diet plan that our coach made us follow. We had to make sure that we ate healthy so that we could be able to stay fit and so that practices wouldn't be so hard. We needed energy. Eventually you learn to eat healthy without even realizing it. We didn't have a specific plan that we had to follow but you just kind of know what is good to eat and what’s not. People that eat healthy had good benefits in the end. Question 7.) Any advice for beginners? I would say, for younger players especially, to try different sports first, then find what you really like. You might like tennis or football or softball, but you should pick something that you really like, because if you really love doing it, you’ll get some good benefits in the end. Also, go every day and go with a positive attitude because then everything else falls into place. Develop your skills, because that's what you are gonna remember when you’re older.